After returning from the Sea of Cortez, we have had a glorious month back in La Paz. I was very fortunate to be welcomed back into the State music school's community (la escuela de musica) which includes rehearsing with their youth orchestra. Although we are a "youth orchestra", the ages range from 12 - 80. I am somewhere in between. In December, we had two concerts celebrating their 15th anniversary. The concerts were sold out, including many cruisers in the audience. It was lots of fun to share the experience of the aspiring music school, a beautiful concert hall and festive concerts for the holidays. 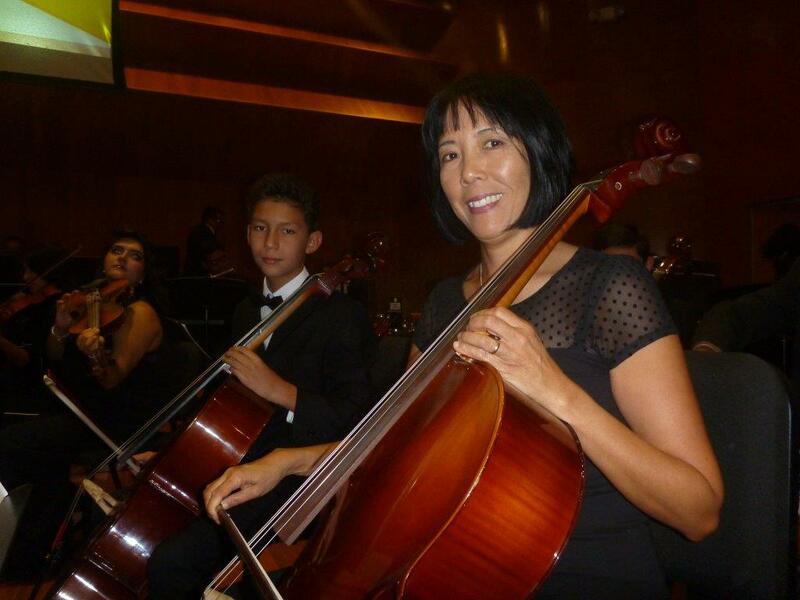 I will continue to play cello with the school when rehearsals resume in January. Rob continues to kitesurf, now at the windy kitesurfing meeca of nearby La Ventana. Several seasonal friends from Canada are also in town to chase the wind. Rob and Tom from Cinnabar have shared many days on the water, and always come back to the marina tired and happy. We are renting a place in Ventana for a month soon with our friends Katie and Mike so that we will all be closer to this sporty scene. And Shindig? She continues to provide ongoing boat projects, but is cleaned up from her month on the water and looking good. We moved a little further towards the end of dock 5 now. Every night around sunset an informal group gathers to catch up, and appreciate the spectacular sunsets. As many cruisers have now returned to their sailboats for the season, it's been a great month for catching up with friends before they move along on their own adventures. We are happy with our plans to stay on the Baja side of Mexico for the rest of the season. No more overnight passages! We will have many visitors coming in the next few months. It'll be good to rediscover La Paz and the surrounding islands with a fresh perspective. And, now that is 2016, we can wish you all a "Happy New Year" and "Feliz Ano Nuevo". May yours bring good Health, Happiness, and Magical times.